Canada is the world's second-largest country (9 970 610 km2), surpassed only by the Russian Federation. More than 35 million people live in Canada. Canada maintains 38 national parks. Canada also has over 1000 provincial parks and nearly 50 territorial parks. There are two million lakes in Canada, covering about 7.6% of the Canadian landmass. The main lakes, in order of the surface area located in Canada are Huron, Great Bear, Superior, Great Slave, Winnipeg, Erie and Ontario. The largest lake situated entirely in Canada is Great Bear Lake (31 326 km2) in the Northwest Territories. Canada is a constitutional monarchy and a federal state with a democratic parliament. The Parliament of Canada, in Ottawa, consists of the House of Commons, whose members are elected, and the Senate, whose members are appointed. On average, members of Parliament are elected every four years. The maple leaf is the country's most important symbol. The National Flag of Canada, also known as the Maple Leaf is a flag consisting of a red field with a white square at its centre, in the middle of which is featured a stylized, 11-pointed, red maple leaf. 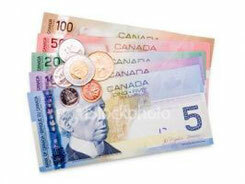 Canadian dollar is the currency of Canada. 1) Is Canada the largest country in the world? 2) What city is the capital of Canada? 3) Does Canada adjoin the U.S? 4) Is Vancouver on an island?